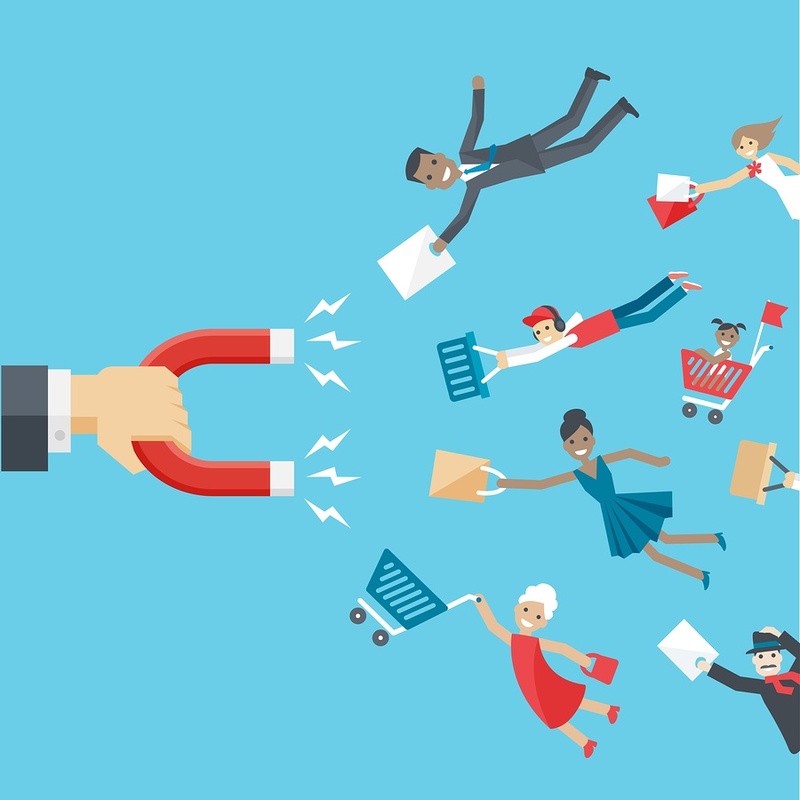 How Does Inbound Marketing Attract Customers? The way people make purchases has shifted towards a system where the customer has much more power. Because people have access to so much more information, they have the opportunity to perform extensive research and be more informed about products and companies than ever before. If customers have so much more power today, how do companies convince these researchers to become customers? The answer: Inbound Marketing. Tactics used by past marketers and salespeople, such as invasive cold calls or emails, reached out to the customer regardless of if they were in need of a service or not. These tactics could seem pushy and even turn the customer off of using your company if they ever needed your service. Inbound marketing instead reaches the customer when they are looking for you. By creating a four step methodology, inbound marketing reaches the customer at every stage of their purchasing journey. This methodology allows you to turn these strangers into repeat customers by providing them with information that is valuable and useful to THEM, not to your company. Because inbound marketing reaches out to people at every stage of the purchasing journey, it is important to develop a comprehensive strategy. At each stage, you will use a different channel to provide information to strangers to turn them into leads and eventual customers. It is important to recognize that in inbound marketing, there is no one specific solution. All the pieces work together to solve the conversion puzzle. The first step of the puzzle is to attract customers. In this stage you are dealing with people who are just beginning to research their problem. You as a business know you are the solution to their problem. However, you cannot just jump in and announce that to them. You are a stranger with no qualifications or references known to this person. They will not trust that you can solve their problem by you simply announcing it. You must prove your worth to them first by way of providing them with valuable and educational information about their problem. We recommend three channels to pursue during the Attract phase of Inbound Marketing. Blogging is an essential tool during the Attract phase because it establishes your business as an expert or authority on your service offering. During this phase, you are not selling your company or your particular service. You are merely stating that you are knowledgeable about the problem your potential customers are experiencing and you have the tools to create a solution for them. If people are performing research about your industry, you need to have information to answer their questions. While your website may provide a good amount of detail, it cannot go into depth and answer questions the way blog articles can. While blogging can be used to increase website traffic or drive up SEO rankings, it is ultimately there as a primary part of attracting potential customers by providing them with valuable information regarding their current problem. While some companies may seem more suited to social media than others, every company can benefit from having a presence on the channel during the Attract phase. Social media provides another avenue where you can tell your potential customers that what you have to offer is valuable and will help solve their problems. When people are performing research, they will look on social media to see that activity of a company on the platform. If your company has no activity, they could pass on you for another company that is offering them valuable information on their account. One thing to remember about social media - while activity is important, the value your activity provides is just as important for attracting customers. Do not simply post to post. Be sure your posts are mindful and created with the goal of establishing yourself as a provider of information, not just a self-promoter or mindless poster. Although some might initially think paid search is more of an outbound marketing technique, it is actually an essential part of Inbound Marketing. Because paid search campaigns are distinctly targeted towards tailored audiences or specific keyword searches, it is actually doing the same thing as the other channels in the Attract phase - providing information to people with a specific problem. When you are using Adwords, social media ads, or any other form of paid search, your ad or website will not show up unless people are specifically searching for what you have to offer. This means that your information is only showing up to those who will find it most valuable. Because of this, you have a much higher chance of attracting them. Your target audience is performing research on you; you need to perform research on them as well. Paid search works best when it is highly targeted towards your specific audience. This audience can only be determined through research and the creation of a buyer persona. Once you have determined who you want to reach, you stand a much better chance of being successful with paid search. As we’ve discussed, the way people make purchases and become customers has changed. People are becoming much more active in the buying process. Instead of letting an advertisement tell them what to do, they are performing research and learning on their own. Instead of trying to fight this change, you can embrace it. Provide people with the answers they are looking for. Work with them instead of against them. By providing them with valuable information, you establish yourself as an authority in your industry and give your potential customers a sense of trust. Congratulations! You’ve now completed the first step of your Inbound Marketing strategy. Are you looking for a way to calculate the effects of your current marketing strategy? Download our Marketing Metrics Calculator to get the numbers that matter!